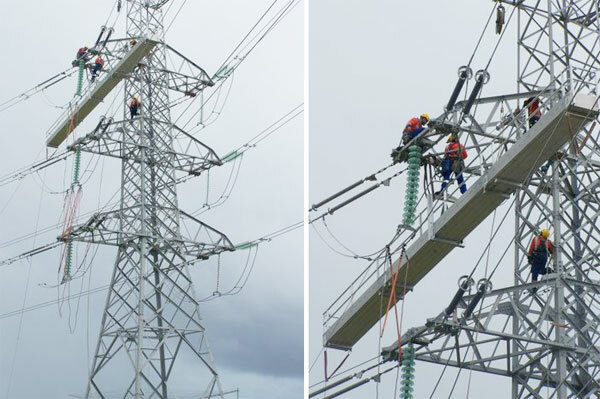 Ullrich have produced a 14 metre gantry for servicing conductors on 220Kv line towers. These gantries not only need to be light - it only weighs 697kg - but strong enough to withstand winching to the top of the towers, and all of the manoeuvring necessary to negotiate the cross-arms. It provides a stable platform for up to 4 or 5 men to work from, whilst hanging from a single point located in the centre, and attached to the cross-arm. This unit also has the capability to be expanded to 19m ( For use on the 440kv lines when they are built ) To stop the unit from see-sawing, each end is attached to a 1000kg bock of concrete located on the ground and tensioned to keep it level. The design of the extrusion and the way it was put together negated the use of conventional truss work, and enabled the SWL to be 150kg per metre which in this case was 2100kg UDL over the length of the platform. Using conventional handrails that are bolted on also meant that should any damage occur to the rails as can often happen when equipment is lifted over them, the structural integrity of the unit is not compromised as a standard truss would be, and they can be replaced easily. Trussed units are used frequently overseas, but this is the first for New Zealand, and the first to not use a truss.